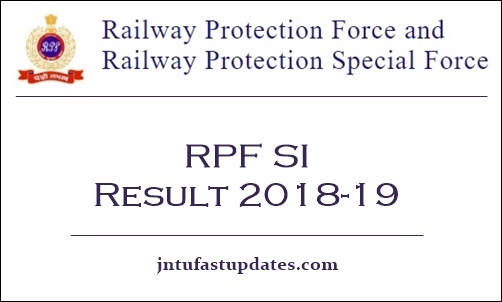 RPF SI Result 2019: Railway Protection Force (RPF) is released the Sub-inspector (SI) written test results 2018-19 on its website, si.rpfonlinereg.org. Aspirants competed for the Sub-inspector examination can stay checking the RPF website on a frequent basis to download the result. The RPF conducted the SI examination in many places across India. More than 14 lakh hopefuls have competed for RPF SI written test round this year. The competition has raised highly for RPF SI Posts this year. The Railway Protection Force conducted the Computer Based Test (CBT) in online for all the competitors. Hopefuls competed for the written test round Phase 1: 19-12-2018 (Group E + F), Phase 2: 05-01-2019 & 06-01-2019 (Group A + B), and Phase 3: 09-01-2019 to 13-01-2019 (Group C + D) can anticipate the results shortly. Meanwhile, the competitors can stay visiting the RPF or Indian Railways official websites for more updates. The Indian Railways will annually announce various job notifications to hire suitable people into various jobs. The Railway Protection Force (RPF) department of Indian Railways has released the notification for 9739 constables and sub-inspector (male and female) posts. In which the announced posts include 1120 Sub-inspector and 8619 constable posts. The RPF has accepted applications from eligible and interested aspirants from 1st June to 30th June 2018. Lakhs of hopefuls seeking to get railway jobs have applied for constable and SI posts during the application dates. As per reports, this year more than 20 lakh aspirants applied for RPF SI and constable posts. The selection of suitable aspirants will be done through various rounds stage 1: Computer Based Test (CBT), Stage 2: Physical Test (PET & PMT), and Stage3: Document Verification (DV) rounds. Candidates applied for RPF Constable and SI posts must have to clear all the rounds to get the jobs in Indian Railways. Hopefuls competed for the Sub-inspector posts on different dates from 19th December 2018 to 13th January 2019 can expect the Sub-inspector result in the months of March/April 2019 [tentatively]. Hence the hopefuls have to stay patient until the result date is announced by Indian Railways. Aspirants competed for RPF SI examination can check the result, score from the RPF official website, si.rpfonlinereg.org. Or from Indian Railways website, indianrailways.gov.in. It will be necessary to obtain 35% marks (30 % marks by SC and ST candidates) to qualify in the CBT. All the eligible candidates have to undergo a Computer Based Test on the specified date, time and venue as per the e-call letter to be downloaded by the candidates from the websites of Indian Railways. The information about the e-call letter download shall be communicated through the websites as well as personnel email communication to the candidates. All the competitors who have competed for the RPF SI examination on various dates can check the cutoff marks and merit list at the time of result announcement. Candidates have to score the required cutoff marks/qualifying marks in the written test round to shortlist for the next rounds of the selection process. RPF SI Cutoff marks category-wise will be announced by the RPF. Candidates scoring the SI Cutoff marks are said to be qualified in the test and the RPF will release the merit list of qualified candidates. RPF Si (Sub Inspector) CBT Exam Results for Group E, Group F Has been Released. Download Shortlisted Candidated For PMT, PET, DV From Below Link. Click on it and provide the required login credentials. The RPF SI Result, cutoff marks, and merit list will appear on the screen.